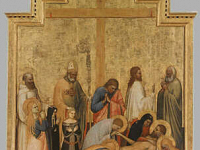 This room displays paintings by Florentine artists whose style was influenced by those novelties introduced by Giotto. 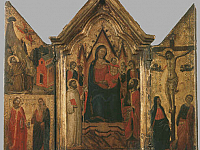 Most of the works in this room come from Florentine churches and some parts of them are missing. 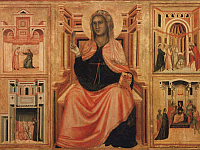 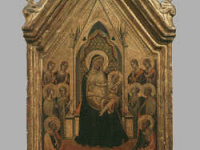 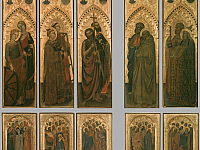 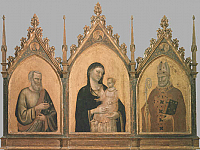 For instance some scenes from the "predella" of the huge San Pancrazio Polyptich by Bernardo Daddi, are lost. 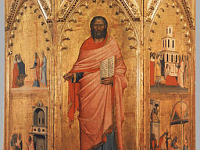 Particularly interesting is St. Matthew Triptych by Andrea and Jacopo di Cione: the unusual shape of the work reveals its original destination. 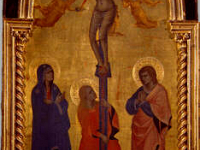 The Triptych was in fact commissioned in 1367 by the Bankers Guild and was meant to be a "clothing" for the west pillar in Orsanmichele Church.